Reading Brittany over at Clumps of Mascara's babysitter horror story reminded me of my own, so I thought I'd share. One of the hardest things I had to deal with after I had BabyCakes was finding a babysitter. I was fortunate to have three months off with her for maternity leave. When we started our babysitter search when she was a few weeks old it was stressful and I had extreme mom guilt. How could I leave my precious fragile baby with a stranger? Why did I have to work at all? Why was childcare so expensive? Finding a babysitter was what HAD to happen. We can't sustain on one income, and neither Hubs nor I have family close by who don't work. When we found her first babysitter, let's call her Sharon, she seemed nice. She had a bunch of fancy baby gear, her home was clean, she was right around the corner from our home and her references spoke highly of her care. She was a five month old exclusively breastfed baby whose pediatrician had not said she could begin solids and I wasn't planning on starting for at least another two months or so. More important: Sharon had neither asked nor told us she was feeding our child baby food. She'd never even consulted us on any allergies, and why should she, if I'm sending breastmilk every day for her sustenance? I texted Sharon and told her I was unhappy that she had given BabyCakes baby food without asking us. Her reply was that she didn't see what the big deal was and that she had been giving her baby food for four weeks. I freaked out. I was angry. I cried. I couldn't believe that this person had been giving my child jarred baby food at four/five months old without my consent. I also felt robbed of the opportunity to be the first person to feed my baby solids. My first baby. At this point my blood is boiling. How could she not understand how not consulting a child's parents -a very young child- about what you are feeding them was a problem? I texted my boss/"work mom" about the situation and she told me to go over to Sharon's house and talk to her face to face about the issue. So we went around the corner, unannounced, to talk to her. When we came in the house my daughter was sitting about one foot from the TV in her car seat. I'm increasingly ready to choke Sharon but I'm still trying to talk. She's saying she takes care of children like they are her own and she felt the baby needed baby food. She's not getting the point at all. She's saying that she feels attacked, threatened and cornered because we showed up unannounced. And you know what? She probably was feeling those things. I'm sure she was feeling paranoid, because I think she was high, as a few minutes into the conversation I began to realize I smelled an underlying scent of marijuana coming from her second floor. I felt like I was in the Twilight-zone. I don't think we could have worked things out if she couldn't acknowledge feeding my child something I hadn't approved was a problem, but there certainly wasn't any way I was going to tolerate marijuana smoking taking place while my child was in her care. At that point I just turned around grabbed our diaper bag, threw BabyCakes's coat on top her and walked out. I was then plagued with another round of mom guilt. How could I not know that she had been feeding my baby baby-food? (part of the answer to this question, that realized later, was that even though I was sending cloth diapers each day, she was partly using her own disposable diapers so I wasn't seeing the solid food poop). How could I ever let my baby out of my sight again? I'm very fortunate that after this experience all her caregivers have been wonderful. She had a great woman who was a family member of a friend watching her for a few weeks while we looked for a daycare, and she's been at a wonderful in-home daycare since then. I also found a great date-night sitter on Care.com. 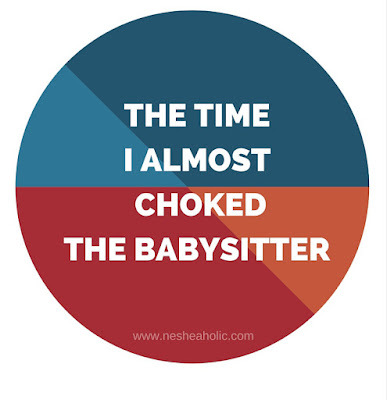 Do you have any babysitter horror stories? OMG. That is horrific. That is so out of line for a caregiver to do that. Right?! I can't believe she couldn't see the problem. THIS IS TERRIBLE. Like, I don't have kids, & even I know that this is SO NOT OK. Who would think this was OK? What kind of professional sitter would do this?! "She felt the baby needed baby food." I feel she needs to find a new effing field of work. Wow. I'm so sorry this happened to you! There is this "thing" with older people who don't feel like breast milk is enough for babies and they should have baby cereal or baby food. That's an incorrect assumption, but I have no problem talking through that with family members. To use that assumption to just give my baby babyfood without talking to me is just CRAY! Oh my gosh! That's just not fair to you as the mom. Totally. Glad we left her early on. The closest I have to a horrific babysitting experience... I live with my nephews, and the eldest (5 yo) has a friend that lives just a couple doors down. They're pretty lax with rules and what their children can and can't do in that house, but we want to encourage the boys to be social, so when my nephew asked to go over to his friend's house, we figured all would be well, and for the most part it is. What drives me nuts, is that the kids play truly violent video games, and they watch horror movies that I would never see myself (all of which belong to the eldest boy there, who is 17 now.) I'm not sure about the movies, but my nephew has come home to me and exclaimed excitedly how he played a popular shooting/violent game for hours, even though he knows that I don't approve of that sort of thing, especially for his age, and more importantly, neither does his mom. There apparently wasn't any supervision at all during that time, so we don't encourage hangouts as much anymore, unless they're going to all play outside. With no supervision luckily the only thing they were getting into was bad games! I was rarely aloud to go to friends houses when I was growing up, and I want more freedom for my daughter, but I also don't want her exposed to things I don't want. It's so hard! Oh my goodness!!! I'm glad you found out as soon as you did. Every daycare should say to stop by at any time. They have to! They welcome it usually unless its nap time understandably but still. Absolutely. How can you tell me I can't come when I want when you have my child?! Wow that is an experience and I'm sorry you had to experience that, but you handled it well. There's no way you gonna have my baby in your care and tell me to call first, also a no to feeding them whatever without clearing it with me first. The nerve of some people. Right?! Couldn't believe it. Glad that's in the past. Yes, I have quite a few nightmarish stories myself that I don't even want to remind myself of now that my daughters are 20, 15 and 14. It's hard when it's your firstborn but I found that I wasn't as fussy about certain things with baby number 2 and 3. That didn't mean that I couldn't be a momma bear when necessary. No matter how many kids you have, you will go off on anyone who mistreats them, even when they are 20.